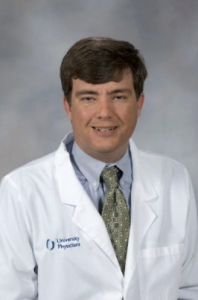 Dr. Darsey is an assistant professor of Emergency Medicine and Pediatrics at the University of Mississippi Medical Center. He is the medical director of the Mississippi Center for Emergency Services, an emergency response umbrella organization that includes a medical communications center (Mississippi MED-COM), a critical care transport division (AirCare), a Public Safety Support Division, and a traditional advanced life support ambulance service. He first obtained his EMT certification in 1998 in Dallas. He gained his bachelor’s of business administration from Southern Methodist University in Dallas. Upon completing undergraduate education in Dallas, he returned to Jackson to complete a master’s in science and doctor of medicine degrees from the University of Mississippi Medical Center. He completed a residency in Emergency Medicine from UMMC and is board certified in Emergency Medicine with active clinical practices in Adult and Pediatric Emergency Medicine. He has been involved in EMS for over 18 years serving as an EMT, paramedic, flight paramedic, EMT instructor and now medical director in a number of different EMS systems. His clinical interest is in the field of emergency, critical care, and transport medicine specifically focusing on innovation, increasing scope of practice, and pushing evidence based clinical advances to first responders of all clinical levels. His academic interest focus on improving medical communications through enhanced radio networks, development of broadband applications, and improving medical education. His community interest are focused on the support of public safety professionals to reduce the mortality rates through innovation, and development of preventative, urgent and operational medical support programs for those servicing our communities. Darsey has been the principal investigator in nearly $20 million of grants focusing on the clinical interest and academic interest of improving the communications, care and coordination of first responders, and the medical care that is provided in the field since 2010.